Simple or dressed up, I love potatoes. As the fall harvest ends, I placed a bulk order of root vegetables from a local farm, including a 10 pound bag of gold potatoes and a pound of garlic. When I read through this week’s recipe for Cook the Book Fridays, I was excited I could enjoy my local vegetables in Scalloped potatoes with blue cheese and roasted garlic by adding only a few more ingredients: cream, sage from my garden (instead of chives), and the wedge of Jasper Hill Farm’s Bayley Hazen Blue in the fridge. First, a few cloves of garlic are roasted until they are soft and mellow, then mashed into a paste. The garlic is infused into some cream (which I lightened with some half-and-half). 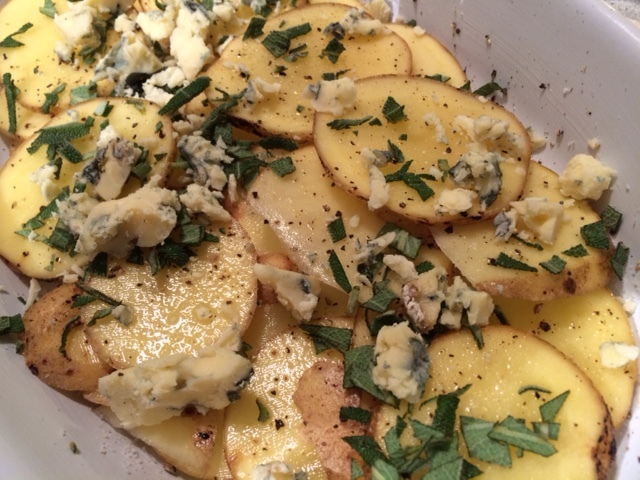 Layers of thinly sliced potatoes are seasoned, then scattered with chopped sage and chunks of the blue cheese: three layers of potatoes in all. The fragrant garlic cream covers it all. The casserole is then baked for an hour until the potatoes are tender. The potatoes were delicious. They reminded me of the Pommes Dauphinois we made for French Fridays with Dorie back in 2010. I served this one night with sous-vide turkey thighs confit that Howard and the next with roasted chicken thighs. Both were a nice foil to the potatoes. However, this one was a little rich for a weeknight dinner, probably more appropriate for a meal shared with company. 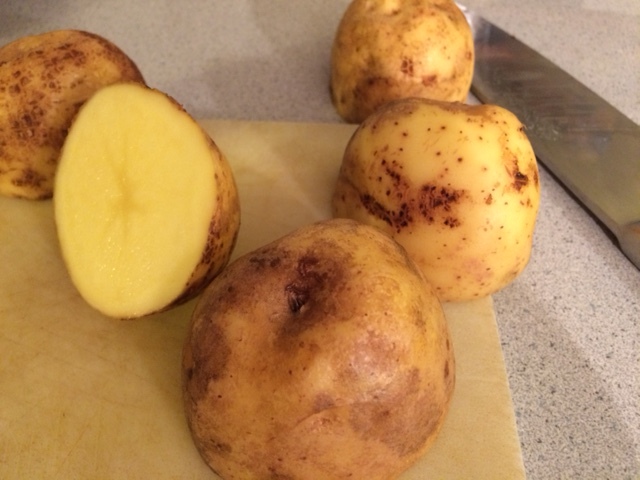 Read what my Cook the Book Fridays friends thought of the potatoes here. You can make them yourself. You can find the recipe here or on page 211 of David Lebovitz’s My Paris Kitchen. As a side note, I’ve been working my way through the approximately 3 gallons of green cherry tomatoes I harvested before our first frost last week. I love this recipe I found for Tiny Fried Green Tomatoes. They are so cute and quite delicious. Also loved this seasonal cocktail, Autumn Margaritas, with apple cider, fresh squeezed lime, and tequila served in a cinnamon-sugar rimmed glass. Posted on 4 November 2016, in Cook The Book Fridays, my paris kitchen and tagged Cook The Book Fridays, my paris kitchen, potatoes. Bookmark the permalink. 11 Comments. Yours look delicious! This is a great recipe. And I agree was terrific leftover. I do agree that this is a rich dish! We had it with some salad greens and it was perfect! Love the roasted garlic, will add more next time! Potatoes gratin with sous-vide turkey thighs confit, yum! Lovely combinations Betsy, it seems this weeks Potato Gratin dish from My Paris Kitchen was a hit among all those who prepared it! Looks delicious! I might try sage instead of chives when I make this, because I have some in the garden too. Definitely think that this is a wonderful dish to make for company – it made the house smell so great too! We have leftovers too and they are still delicious! The smell was just incredible!!! That first photo is a perfect one, makes it look so delicious. This was a good recipe and I will make it again, we loved it. Yours looks perfect! This was good, but I agree, more of a company dish than a weeknight one. I bet your root vegetables are terrific, too.